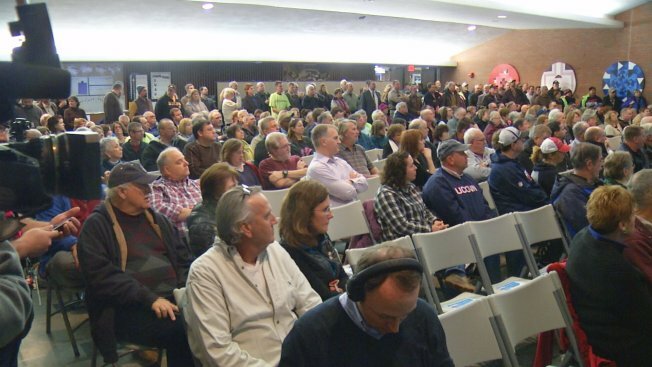 Residents in one of two Connecticut communities chosen as finalists for the state's third casino, crowded a school auditorium Tuesday night, to hear about those plans. More than 300 people packed the East Windsor Middle School for a meeting with the chairmen of the Mashantucket Pequot and Mohegan tribes. For the first hour, the men laid out their argument for why Connecticut needs a third casino. They said MGM's brand new casino project going up 15 miles north in downtown Springfield, Massachusetts poses as a threat to the state's economy. They warned that Connecticut could lose 9,400 jobs and $702 million in revenue when the competing casino opens. However, they said a third casino could add to the economy, by adding jobs and upwards of $6 million to the community they chose. People lined up at the microphone to have their voice heard and get their questions answered. While some said they came to the meeting undecided about the project, many already had their minds made up before the meeting even began. “There’s a lot of people that need jobs. It would help East Windsor a lot," said Donald Arsenault of East Windsor. “Casinos have an element that, like it or not, isn’t advantageous," argued Michelle Vannelli of Windsor, a community stuck right in between the two casino finalists, East Windsor and Windsor Locks. East Windor’s long-abandoned Showcase Cinemas, right off the interstate, is one of two finalists for the $300 million casino project. Among the concerns brought up Tuesday night was congestion on I-91. “I feel the traffic will be so bad I won’t want to come here anymore," said Bonnue Karkowski, also of Windsor. There's also the potential burden on emergency services. “Me living right there, I’m concerned about crime," said East Windsor resident David Bania. Another issue said some residents, the toll the casino may take on the town’s infrastructure, from water and sewer, to roads. Tribal leaders wouldn’t say how much they’re willing to give the town to cover those costs. “We stay very cognoscente of the demands that we place on the public services of the community and we come to arrangements that are mutually beneficial," explained Mohegan Tribe Chairman Kevin Brown. Earlier Tuesday, the Coalition Against Casino Expansion said they do not want a third casino, focusing on the negative economic and social impact of gambling, bringing out victims of gambling addiction to state their case. "I took it from playing bingo all the way to sleeping in a prison," said Joanie Masot of Advocacy Unlimited. "Before 2008, all I did was gambling. And literally in 2008, I hit the bottom rock. I lost my businesses. I lost my job. I lost everything," said Adam Osmond of Farmington. Several bills dealing with the casino issue are also being considered in the state legislature, including one that would require a competitive bidding process. That would open up the project to other developers besides the two tribes. Another would require town referendum before moving forward with a new casino. “Time is not our friend. MGM has steel going up. Any delay in this process, whether it’s at the town level, the state level, isn’t going to be helpful," said Rodney Butler, Mashantucket Pequot Tribe Chairman, adding that at the end of the day they want to work with townspeople and lawmakers to be welcome members of the community they want to build in. Richard Ellis a gambler himself, said he's all in. “I’d rather gamble in my own town than go way down to Norwich," Ellis explained. MGM says they expect to have their new casino opened in Springfield in Fall of 2018. Connecticut's tribal leaders say they hope to have theirs up and running in 12 to 18 months. They plan to hold a meeting Thursday at 7:30 at the Windsor Locks High School.